Long ago, before there were hospitals, doctors, and pharmaceuticals… there were plants. From the beginning of time people have used plants to heal their bodies and treat disease. The roots, stalks, leaves, seeds, bark, nuts, and sap of various trees, flowers, shrubs, and herbs have been utilized to treat everything from headaches to cancer. It has only been over the last 150 years or so that modern medicine has replaced what had been used for thousands of years prior. Sadly, with the passing of only few generations our knowledge of these plants has almost disappeared. We no longer know their names, what they look like, where they grow, or how to use them. When folks USED to get an infection, they’d know which plants to go and find outside for treating it. But now the just blindly head into the doctor and take whatever antibiotics they’re prescribed. There could come a time in the future, possibly the near future, when knowing how to use plants as medicine will be lifesaving. If you can start growing those plants or learning how to identify them in the wild, and practice treating yourself with them now you’ll be much better off whatever lies ahead. Do thorough research, gather plenty of reliable resources to cross-reference, and use caution when delving into medicinal herbs. Although the plants are completely natural their components can be very powerful. There might be side-effects, contraindications, allergic reactions, and dosages to watch out for. If herbalism courses, or wild medicinal foraging classes are available in your area, it would be a good investment to consider. Today, we’ll start slowly and focus on fighting infections with plants. Let’s dive in. Over the years, garlic has become my number one go-to for fighting nasty internal infections. I love it because it’s something you can easily grow, it stores for months, and is extremely effective as a natural antibiotic for certain types of infections. Garlic is most effective when used fresh. However, the fresh juice is very, very strong and can cause burns on the skin if applied directly. It’s best to dilute garlic in a carrier oil, such as coconut oil or olive oil, or make a tea with it to wash infected skin. Never put garlic in your eyes. To ward off infections, add garlic cloves to your diet regularly. Eat 3-6 crushed cloves daily for severe gastroenteritis, dysentery, worms, and infections. For mouth ulcers, hold a chopped clove against the sore spot for a few minutes. For plantar warts, rub coconut oil or vaseline around the affected area to protect the healthy skin from being burned, then apply a thin slice of fresh garlic to the wart and cover with a bandage. Replace the garlic with a fresh slice daily until the wart is gone. It should take about a week or so for it to completely disappear. Fungal skin infections can be relieved by rubbing a paste of crushed garlic and olive oil over the affected area. Make a garlic clove tea to soak feet in to clear up athlete’s foot. Garlic can be fed to some animals (including poultry!) to help prevent parasites, ticks, and fleas. Personally, I have found garlic oil to be extremely effective at treating ear infections and upper respiratory infections. To make the oil, combine 2-3 large garlic cloves, peeled and chopped, with 2-3 Tbsp olive or coconut oil. Heat over low in a small saucepan until the garlic gets soft (but not browned). Remove from heat, crush the cloves in the oil with a fork to extract more juice, and allow to sit for 10 min. or so before using. Heat the oil gently before each use for best results. Never microwave garlic oil! And always test it on your wrist to be sure it isn’t too hot before applying. For pain in the ears caused by a cold (not swimmer’s ear where water is the issue), drop 2-3 drops of warm garlic oil directly into the ear and allow to sit for 5 min. or so before draining. I also like to rub the warm oil all over the outer ear and down the neck. Lay the good ear on a heating pad (if possible) with the bad ear up so the oil can soak in. Repeat several times a day until the pain is gone, then continue for an additional two days just to be sure the infection doesn’t return. If the pain does not get better within 24 hours see a doctor. For phlemy chest congestion, rub warm garlic oil all over the chest and the back where the lungs are. Repeat several times a day. At bedtime continue as directed, also applying to the bottoms of clean feet covered with socks. 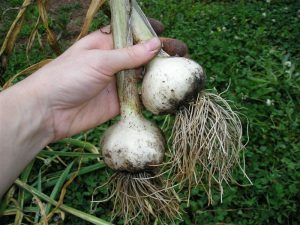 The cool thing about having garlic in your survival garden is that it makes a great companion plant for fruit trees by repelling common pests, and it’s also easy to disguise in a food forest. This one I can’t speak to from personal experience, as I have yet to try cayenne pepper to fight infections. But there seems to be a ton of anecdotal evidence pointing toward cayenne as a powerful antibiotic in certain situations. One dosage recommendation I found was to take 1 tsp of powdered cayenne pepper in a glass of warm water. This is said to be more effective than taking it in capsule form. I imagine you could probably swish this solution in your mouth to relieve oral infections as well. I’d love to know if any of you have tried this. Cayenne is pretty easy to grow in a garden. It loves warm, sunny weather. Plant in spring as soon as the danger of frost has passed. 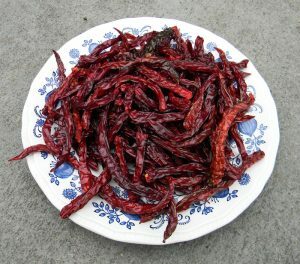 Cayenne can be hung and stored in a dry location, or seeded and dehydrated. For more tips on how to make your own antibiotics click here. Many home gardeners have Purple Coneflower growing in their flower beds simply for their beauty and reliability. But did you know that they’re actually medicinal? Echinacea root is the plant part primarily used in herbal medicine. Harvest the root after the plant has flowered; wash, chop, and dry. Make a tincture or powder of the root for almost any type of inflammation or infection. Powdered Echinacea root can be taken internally in capsule form. Echinacea root tincture or powder can be used for almost any type of internal inflammation or infection. Adults take 200-300 mg. capsules up to three times a day at the onset of acute infections, such as colds, influenza, and kidney or urinary tract infections. For children, half the adult dose for ages 6-13, and one-quarter the adult dose for those under age six. Slowly simmer 4-6 Tbsp dried Echinacea root (or 6-8 Tbsp fresh) in water, covered, for 25-45 min. to make a decoction. Use the decoction to wash infected wounds frequently. For sore throats, mix 10 ml tincture in a glass of water and gargle. Use powdered root to dust weeping skin conditions, such as boils and eczema. Echinacea is widely used to fight infections, especially the common cold, the flu, and other upper respiratory infections. This amazing plant grows well in a home garden, and will come back year after year with very little care. 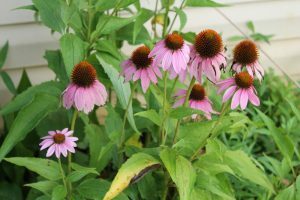 Once Echinacea has bloomed and the flower head has completely dried up and gone to seed, I like to collect the seeds and scatter them around other flower beds and along the forest line to naturalize the plants. You can never have too much coneflower! Ginger root, technically a rhizome, has been used for thousands of years for medicinal purposes. Recent studies have backed up claims that ginger can play a powerful role in the realm of medicine, particularly against foodborne pathogens such as salmonella, E. coli, and other nasty bugs. Another study showed a mixture of ginger and honey to be more effective against MRSA and other drug-resistant bacteria strains than antibiotics. 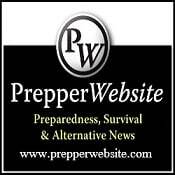 This article further explains the conclusions from this fascinating experiment. Ginger is surprisingly easy to grow at home. It prefers dappled sunlight, rich soil amended with compost, and hot, humid weather. A greenhouse might work as a perfect environment if you live in cooler, drier conditions. Bring ginger plants indoors during the fall and winter as it won’t tolerate cool weather. You can plant ginger from a store bought rhizome. Choose a plump, healthy looking “root” with well developed growth buds, and plant directly in soil. 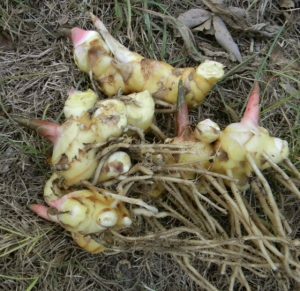 Ginger will come back year after year if cared for properly, and will supply you with plenty of extra rhizomes to harvest and use. The great thing about each of these plants is that they don’t take up much space at all, and can be completely concealed in an ornamental flower bed if that’s all you have. Garlic is best planted in the fall; ginger, purple coneflower, and cayenne are best planted in spring after the danger of frost has passed. Wherever you live, plan to put in all or a few of these powerful medicinals in your garden and get prepared for a time when you might need to use them. 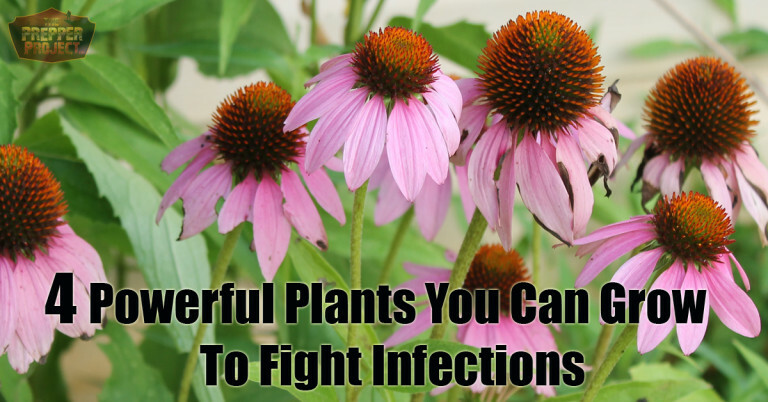 Be the first to comment on "4 Powerful Plants You Can Grow To Fight Infections Naturally"